See ZooNation’s sold-out Alice’s Adventures in Wonderland-inspired hip-hop theatre show, wherever you are in the world. ZooNation’s Royal Opera House Christmas production, The Mad Hatter’s Tea Party was live-streamed on 18 December at 6.50pm GMT. The recording is no longer available on iplayer. An early Christmas present, the stream will offer a world-wide audience the chance to see the sold-out hip hop-theatre production inspired by Alice’s Adventures in Wonderland, The Royal Ballet’s take on which is being performed on the Covent Garden main stage over the festive period. Subscribe to our YouTube channel to be notified when we publish an exclusive dance off between two Mad Hatters taking to the ROH stages this Christmas! The live stream is delivered in association with BBC Arts and will also be available on the BBC Arts website. 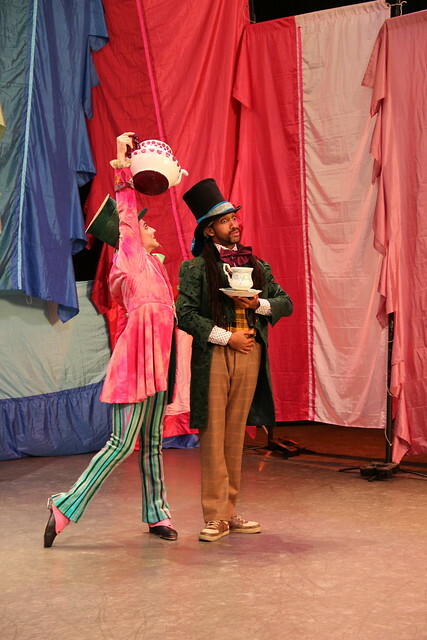 Drawing on influences as diverse as Shakespeare and Sondheim, The Mad Hatter’s Tea Party sees the Wonderland characters in therapy, enacting a never-ending tea party. The show is suitable for children aged 5 years and above. The production features Turbo (Sky’s ‘Got to Dance’, CBBC’s ‘Turbo Boost’) and Tommy Franzen (Zoo Nation’s Some Like it Hip Hop, Goldberg at the Royal Opera House) as part of the ZooNation Company and is set to a newly-commissioned score. The Royal Opera House YouTube channel is about to hit 100,000 subscribers and is the most subscribed-to channel of any arts organization in the world. As well as occasional live streams of performances and events, the channel features regular uploads of behind-the-scenes films and production clips. For photographs, films, reviews and more information about The Royal Ballet and ZooNation Dance Company, visit www.roh.org.uk/publications and claim your free The Mad Hatter’s Tea Party Digital Programme with promo code ‘teaparty’. Yes, that's the way to do it. Thank you ROH! BTW, the "Mad Hatter" was a fantastic show; saw it tonight with my daughter and we both loved it! We also saw "Alice in Wonderland" on the 6th- it was the daughter's first time to see it and my second one (2012 being the 1st). Both shows are excellent, they compliment each other beautifully- and our festive season has been kicked off nicely! Offering a worldwide audience the chance to see the groovy "Mad Hatter" for free on line is quite a treat. The Royal Opera House must be proud of themselves for this - and it makes me a very happy ROH supporter and regular opera (and ballet)- goer. would love a cd with the music?? I love this show! It is great that you are showing it live on line! Do you sell the soundtrack in your shop? This soundtrack isn't available yet - but do keep an eye out. Very disappointed to miss this. Will there be another opportunity to see it? Yes, it'll be on our YouTube channel very soon.